If I was a betting man I would not have laid money on the elusive spirit of delight appearing at yesterday's Snape Prom, which was given by the band in my header shot, the Suffolk Youth Orchestra. 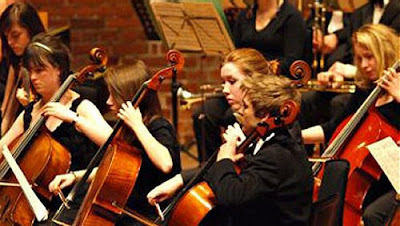 Of course, it goes without saying that the young musicians in the orchestra are dedicated and talented, as it goes without saying that their conductor Philip Shaw, who is senior county music advisor to Suffolk County Council, and his colleagues behind the scenes at the orchestra are committed and hard working. But that does not explained what happened yesterday evening. Gershwin's Cuban Overture and Dvořák's The Water Goblin in the first half were well executed but unexceptional. But from the first bars of Rachmaninov's Second Symphony after the interval it was clear that something truly remarkable was happening. As the symphony progressed to the mighty Adagio that is the core of the work it seemed quite inconceivable that music of such power and emotional intensity, indeed such spirit of delight, could be coming from the same teenagers we had seen playing ball in the sunshine outside the Maltings an hour earlier. Perhaps some of the Russian soul had soaked into the bricks of the Maltings. Perhaps the spirit of Rostropovich, who we had heard conduct young musicians in an electrifying Tchaikovsky Serenade for Strings in the very same hall thirty years ago, had returned to Snape. Perhaps a mystical life force had possessed the performers. Or was, in this of all places, Britten's holy triangle of composer, performer and listener working its magic? As that holy triangle tells us, great music making only happens when creative energy can flow freely between composer, performer and listener. Yet almost all of the current efforts to reach new audiences involve building the very barriers that block the vital energy flow. Classical music does not need a celebrity culture, it does not need inane presentation, it does not need to be markeketed like cornflakes by PR agencies, it does not need note perfect performances, it does not need national flags on the platform and it does not need the other brands of consultant created snake oil currently doing the rounds. What it desperately needs is for the energy to start flowing again from composer to performer and listener. But that can only happen after all the middle feeders and other crap currently blocking classical music's arteries have been flushed out. As the Suffolk Youth Orchestra proved so convincingly last night. After the quite stunning Rachmaninov he did not attempt a crowd pleasing encore. The SYO's playing of the symphony spoke for itself. Nothing more was needed, and nothing more was offered. Despite the demands of the 15 minute Adagio on the young players he moved straight into the final Allegro vivace with scarcely a pause, thereby maintaining the momentum and sweep of the symphony.